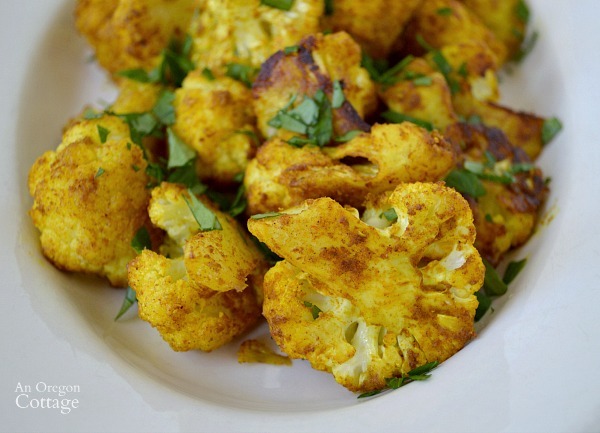 This recipe for healthy turmeric roasted cauliflower adds spice from cayenne as well as garlic, onion, cumin and a hint of cinnamon. Take a look at more Quick Healthy Recipes. 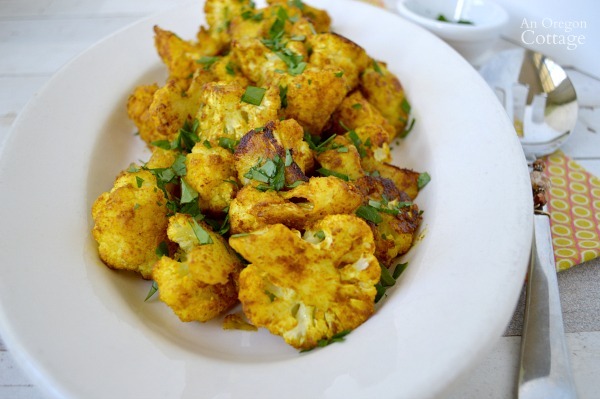 I just have to laugh at this: I was all excited as I created this dish of turmeric roasted cauliflower, adding different spices and figuring out how much of good-for-you turmeric I could add before it was too much, if you know what I mean. As I’m tasting it, with it’s amazing mix of flavors and spots of roasted-crunchy-goodness, I’m thinking about how you’re all going to love it (well, if you like cauliflower, that is) and that I can’t wait to share it. So I start to edit the photos and decide to visit Google to see about a title for this dish I “made up” (I do this often to make sure I get some Google love when people are searching) and, bam- pages and pages of “my” recipe! Of course you know what I’m going to say next, right? But this recipe is better than all the others. Only, since I haven’t tried all the others, I can’t really say that, so I’ll just say it’s very, very, good. I added a few other spices since I don’t happen to think turmeric has that much flavor – like a healthy dose of cayenne (another good-for-you spice) which is why the “spicy” is in the title. 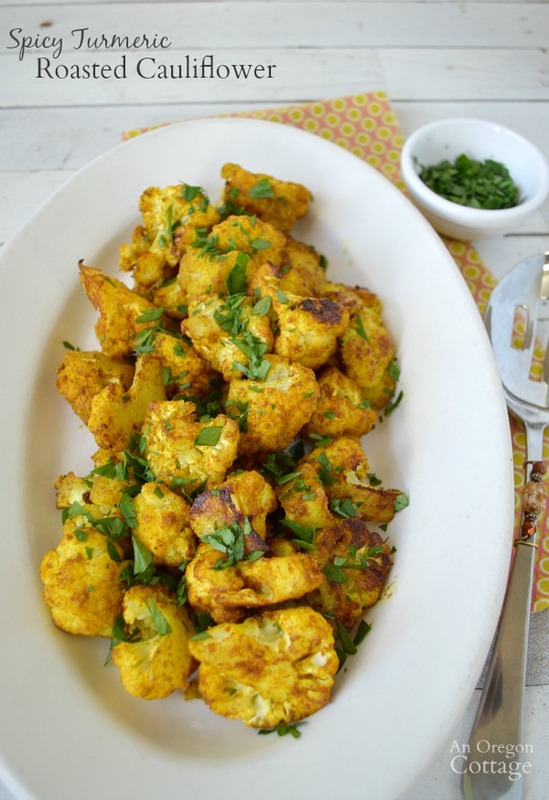 We like things spicy around here, but that’s always adjustable in my recipes, so if you don’t, you can go back to the plain turmeric roasted cauliflower title. 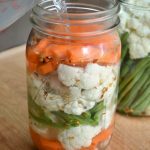 I’ve had a long love affair with cauliflower–but only in my adult years. I think like most kids there weren’t many vegetables I would eat. And then I did and a number of cauliflower recipes became regulars in our house (this amazing soup is one I’ve been making for years–even cauliflower haters like it!). 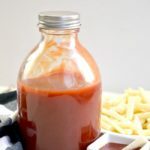 But when I was pregnant with our second child, that’s when I couldn’t get enough of the stuff! Isn’t that weird? I’ve really never heard of any pregnant lady with a craving for cauliflower before or since. 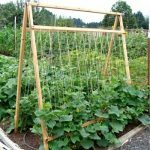 I literally used to dream about it – usually dripping with butter! Now if I dream of it ever again, it may just be covered in these spices. I like to think this mixture of yummy spices (like onion and garlic powders, cumin and a hint of cinnamon) makes my version of this dish waaaay better than all the others. But since I really like this, I’m not gonna waste my time with any other recipe to find out – and I’m okay with that. Are you a cauliflower fan? Thank you for your reply about the strawberry gluten free coconut crust , I lost good recipe. Wow wee, just tried your flourless chocolate cookies. Yum , yum. I have convinced everyone I’m a real cook. (little do they know , guess I will have to share my secret). I am going to try the cauliflower tomorrow. It looks so wonderful. Thanks Jami, keep um coming. I so enjoy your blog and I’m always happy to see a new post in my inbox. Thanks so much for sharing with us. What a sweet thing to say, Lana – thank you so much and I hope you enjoy the cauliflower! My husband’s grandma introduced me to cauliflower when I was a young bride at the first hubby’s family Thanksgiving- she would steam a whole head of trimmed cauliflower and top it with a small pan full of butter fried breadcrumbs. It has become a staple in our house! We also love roasted cauliflower. Oh, I think that’s such a pretty presentation, Michele! I don’t steam a whole head often, though.